Twenty One Pilots is vocalist, bassist, ukulelist, and pianist Tyler Joseph and drummer Josh Dun. Two musicians that put on a fantastic show that captures audiences all around the globe. 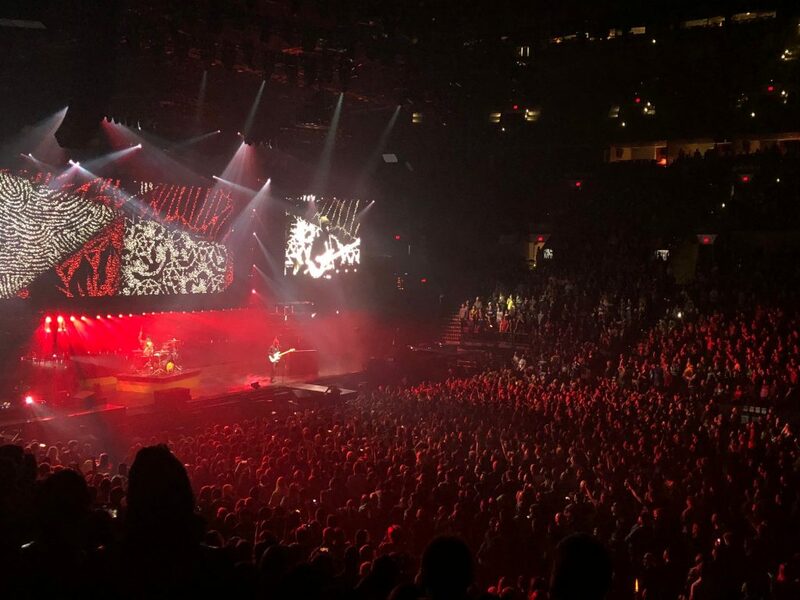 Their most recent tour, The Bandito Tour, in support of their new album Trench, has already planned multiple legs spanning across almost every continent. Our team attended both the Portland and Tacoma show of leg 1 and will be attending one show of leg 2. We highly suggest being seated for this tour if you have any sensory difficulties, as the GA crowd is very active up front. However, the back of the GA always had lots of room to move, which is a fantastic choice for those with GA tickets that have tactile sensitivities and don’t care as much about sightlines. If you do want to experience GA from the front, be prepared to camp outside several days in advance, and experience a lot of intense pushing and jumping near the barricade. The fans are super excited to be there and carry you right along with their love for this band. The Bandito Tour features opening acts Max Frost and Awolnation. Max Frost, an eclectic pop one-man show started off the night showcasing his talents on guitar, drums and piano. His upbeat music is almost impossible not to dance to. The standing pit started bopping to the beat as those in the seats stood up. Frost encouraged waving arms and some bouncing, but otherwise it was a very relaxed thirty minutes. In between Max Frost and Awolnation, the standing pit began to shift forward as more and more people tried to get closer to the stage. Pushing could be experienced from all directions. When this begins to happen, we suggest trying to be constantly in check with yourself. You will experience tactile pressure from all sides, and it will be very hot in the pit. Awolnation began thirty minutes after Max Frost’s set ended. 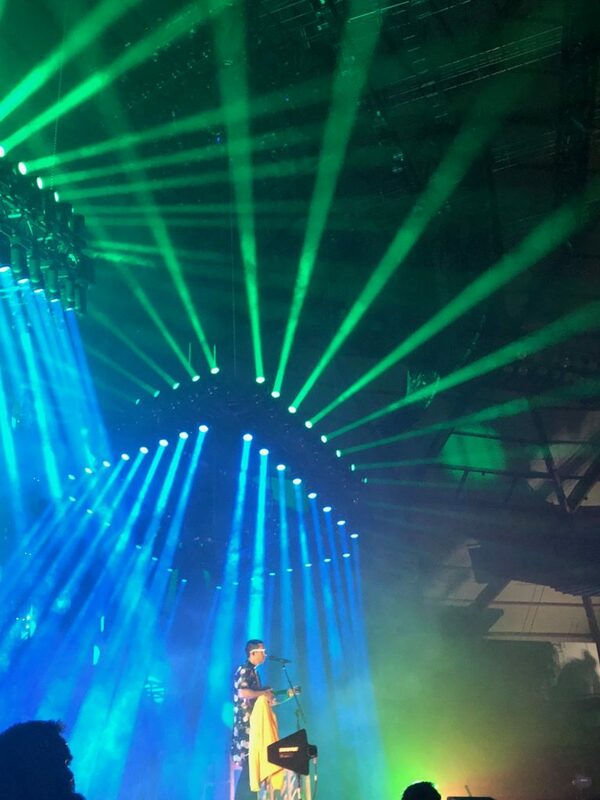 The band entered the stage and immediately the back wall of the stage lit up and began flashing. These were the most intense lights. Awolnation’s music is mostly upbeat and has pop, heavy rock and electro elements. The standing pit jumped and danced during the most energetic songs, with encouragement from the frontman. During the slower songs, the frontman told the standing floor to all put their arms around each other and sway back and forth. This was a calm moment that lasted about two minutes. You can expect people’s arms on you and you will be moved lightly back and forth. If the bright flashing lights are bothersome, we recommend wearing sunglasses during the energetic songs. After their set ended, the crowd anxiously waited another 30 minutes for the main act to come on. A curtain is put up about 15 minutes in, which causes cheering and screaming in excitement. While waiting, you can expect some pushing, cheering, and rumbling from the seats. At around 5 minutes after the start time, the curtain drops and the drummer emerges with a torch and walks around the stage. This causes a big push forward, so mentally prepare yourself for that. After the initial rush of excitement is over, the first song begins to play. The show opens with Jumpsuit, a rock-infused song that makes the crowd jump to the beat almost immediately. The lights are placed on the top and sides of the stage, as the back wall has become a huge screen. The bridge of the song is a soft piano section that causes the pit to calm down for a minute, but it quickly picks up again. The show goes on with almost every song having at least waving/pulsing arms. If you’re close to the front, the right side and center of the crowd tends to be more energetic than the left side, so aim for the left side for a calmer experience. 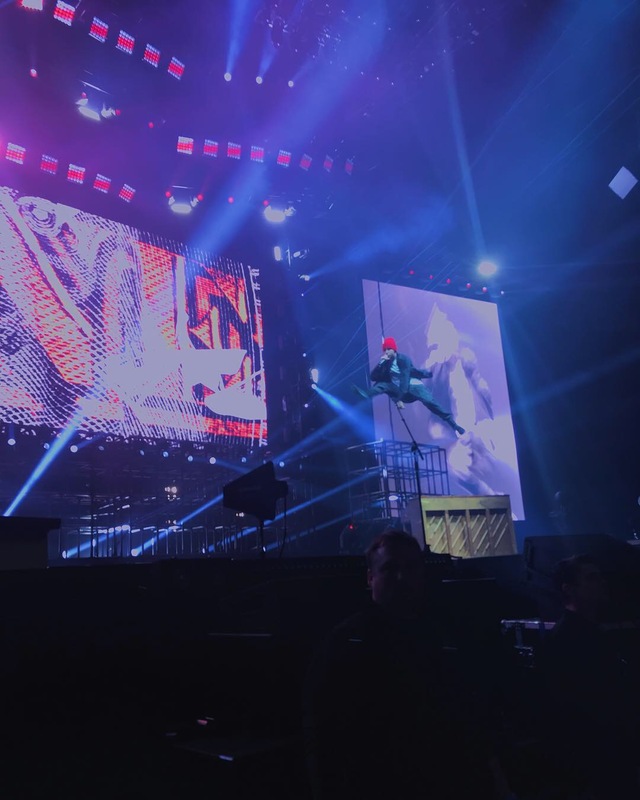 Frontman Tyler Joseph encourages jumping for several songs including Lane Boy, Pet Cheetah, Car Radio, and Trees. During Lane Boy, he asks the pit to get “down low” before jumping up as the beat drops, and it is arguably the craziest moment of the show. If you don’t want to experience this, we recommend trying to make your way away from the front and center. During the song Holding On To You, Joseph goes out into the crowd, right-center, for the first verse. This causes lots of pushing towards him. We recommend mentally preparing for this ahead of time, and when the push happens going with the crowd. Once Joseph gets back on stage, the pit will calm down and loosen up. The same thing happens with a drum platform and the drummer Josh Dun during Morph, left-center. At the end of the finale Trees, both members of the band stand on platforms placed on the audience and hit drums held up by the audience. There is lots of confetti, water coming off the drums, and lots of pushing. There is also jumping during earlier choruses. We recommend trying to get away from the front if you do not want to experience as much pushing. 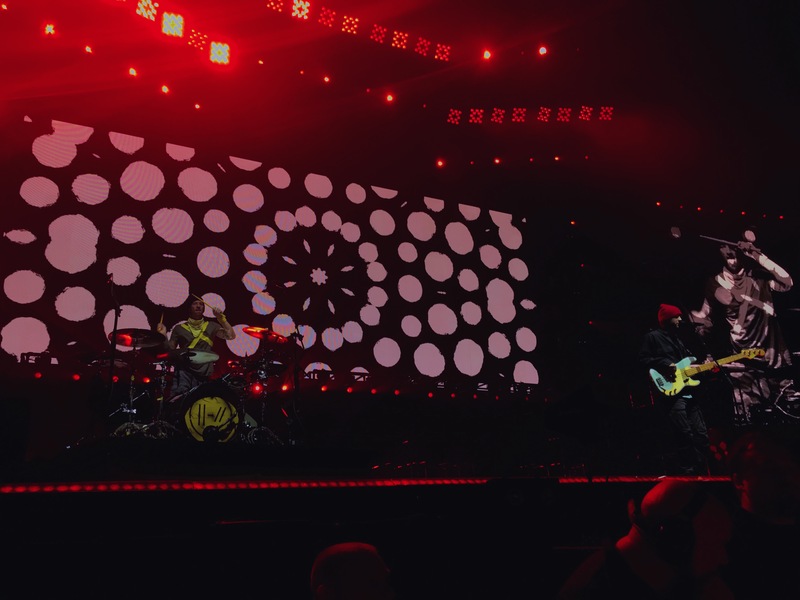 Overall, Twenty One Pilots put on a wonderful, engaging show that had the entire audience cheering, singing, crying, and laughing. Although it is difficult to be in the pit, the show is aesthetically beautiful from the seats and really anywhere in the stadium. Every spot is a good spot for this amazing experience.